For most people, much of what is reported as news is confusing unless simplified and accompanied by illustrations. News of the Arab/Israel conflict - so often beset with conflicting versions of reality - is especially confusing for many reasons, including the fact that many of the people reporting it have only the most tenuous grasp on the history of the protagonists or of the languages in which the events happen and in which each side tells its own story to its own people. There’s an expression we all know: that a picture is worth a thousand words. The problem is very few people have the patience to read or listen to the thousand words. And those with the motivation and agenda to drive their message forwards via pictures are very often able to get away with tremendous distortions of reality. 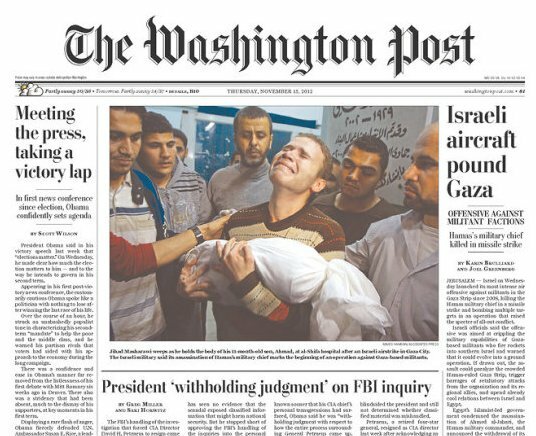 In a fast moving, competitive news industry, far too few editors do what we expect them to do – check the imagery and validate the reality that it seems to be representing before showing it to their audiences. The thousand words represented by the picture too often turn out to be a thousand malicious, distorting, lying words. 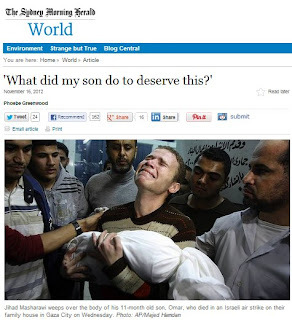 In this post, we have pasted numerous versions of a powerful, painful image from November 2012. 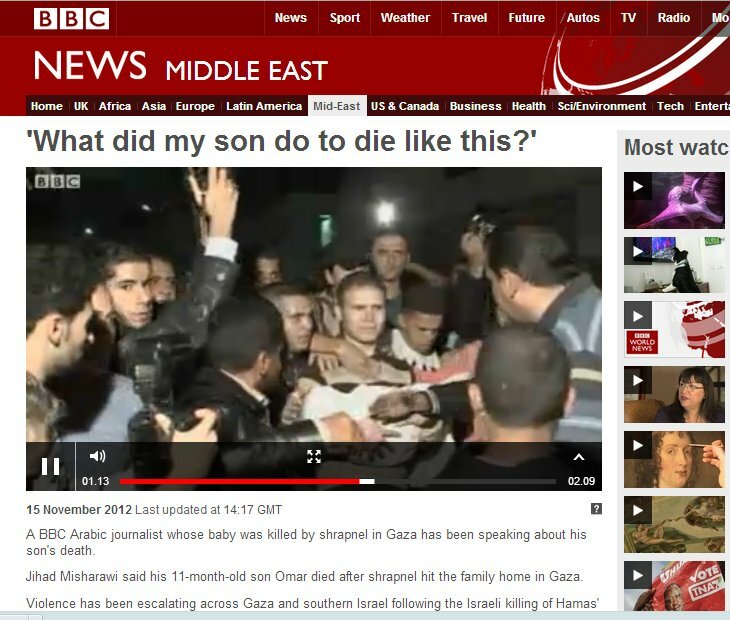 It shows a man called Jihad Masharawi who works for the BBC in its Arabic department. He is holding a child – sometimes wrapped up in a white shroud, sometimes in other poses. 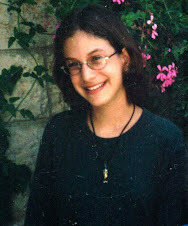 There are many photos of Jihad on the web from that month. His face displays the grief of a father. A shooting war is going on in the background. Thousands of rockets have been fired by the terrorist forces of the Gaza Strip at Israelis. The terrorists never claimed to be firing them either at the Israeli army or at strategic Israeli sites like power stations or roads. They were being fired wherever Israelis could be found and hit, and damn the consequences (our words, not theirs). Now flash forward four months. We’re in March 2013, and the memories of the intense and frightening battles of November are receding into the background. 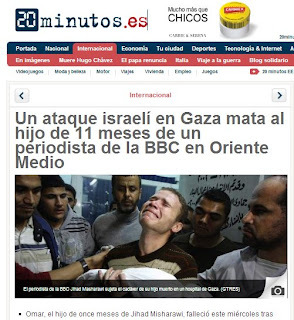 The Elder of Ziyon blog, that followed this story closely from the start, reported Friday that "UN verifies that BBC reporter's son was killed by Hamas". 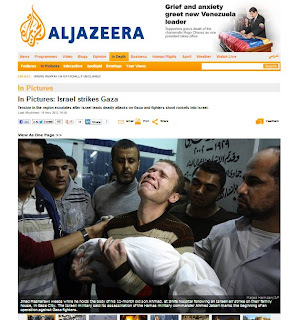 The Jewish publication Algemeiner carried a similar report on its website yesterday. The UN Human Rights Council released an advanced version of its report on Israel’s November conflict with Gaza terrorists this week. The report is unusually fair to Israel, and disputes several claims made by Western media against Israel during Operation Pillar of Defense. 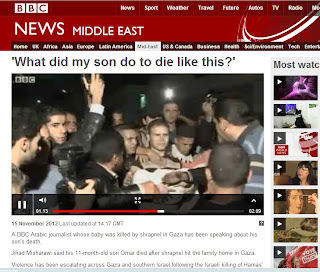 Most significantly the report says that in all likelihood the 11-month-old child of a BBC employee Jihad Misharawi was killed during Operation Pillar of Defense by Hamas rocket fire rather than by Israel, the side initially blamed in reports by the BBC and several other media outlets covering the conflict. The UNHRC report says: “On 14 November, a woman, her 11-month-old infant, and an 18-year-old adult in Al-Zaitoun were killed by what appeared to be a Palestinian rocket that fell short of Israel.69"
If you click on footnote 69, it says the incident was monitored by the OHCHR and they believe the attack came from a Hamas rocket. Rockets intended to hit Israelis and fired by Hamas and other terrorist groups in Gaza routinely ‘fall short’ as we have noted here many times. See for instance "18-Nov-12: Fell short? Not just the Hamas rockets but the ethics of the journalists covering them"; "8-Sep-12: Familiar routine: rocket and mortar attacks during Sabbath"; 2-May-12: Terrorists' rocket falls short, crashes near security fence" and many more similar reports here. Even if (to be ridiculously cautious about this) no one can say with utter certainty that it was a Hamas rocket - as distinct from an IDF rocket - that killed Jihad's baby, we can say with complete certainty that the matter is in doubt - at least. But people who watched news reports in some of the world's most influential channels and via some of the most credible newspapers this past November know nothing of that doubt. 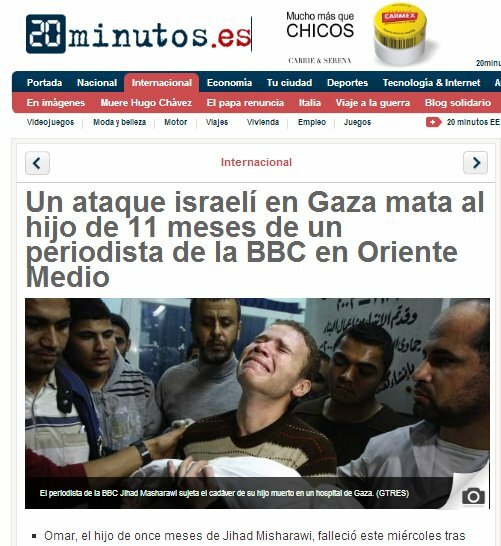 For them, Israel stands behind the death of yet another innocent child. And there is no room for doubt because, if there were, the news sources would have surely said so. Except that it's a lie. And lies like this one have real consequences. They are part of a phenomenon increasingly recognized as cognitive warfare. 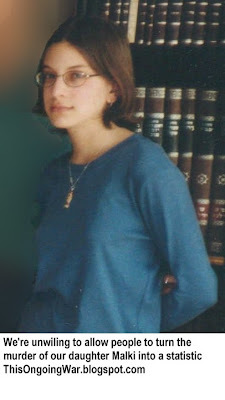 For instances when the protagonists persuade you that a little girl of 3 called Raja Abu Shaban was killed by Israelis when they know it was untrue [source], and then much later admit something entirely different happened. And when an unarmed and terrified boy of twelve appears to come under sustained point-blank gunfire by Israeli forces for three-quarters of an hour until one of them finally manages to hit him and kill him [source], except that a video shows him alive after he "died". 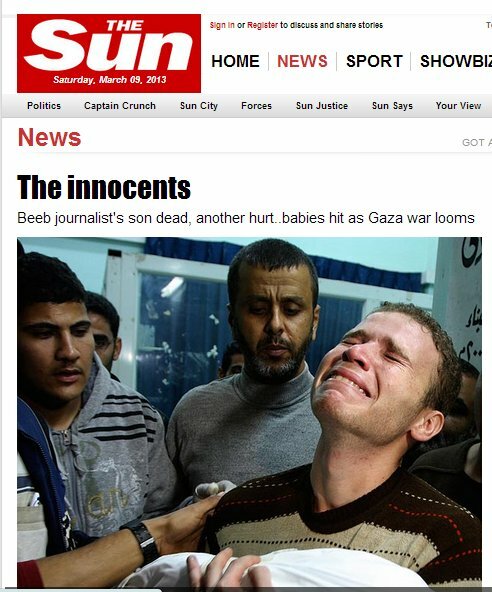 But after we pause to share the pain of a family whose child is now certainly dead, we are left to think about the cynical manipulation of the imagery of grief and of death in the cause of a war prosecuted by terrorists. And about the reporters, photographers, sub-editors and editors, working for major international media companies and government-controlled corporations, without whose incompetence (at one end of the scale) and agenda-driven political passion (at the other) these outrageous acts of journalistic sabotage could never happen.